MarksBlackPot: Dutch Oven Recipes and Cooking: The Feast Goes On! Yesterday was the big day, and I had a blast cooking it this year. For those that are newcomers to the Black Pot, or are finding this post as their first introduction to the blog, here's the story, in a nutshell: Once a year, I cook up a big feast (a full 7 course meal) entirely in my dutch ovens. I start early in the day and cook until it's all done, when the guests arrive. I do it partly to celebrate Mother's Day, and partly to challenge myself and my cooking skills. This year, I chose to do some pretty tough dishes, I thought, but I was pretty calm. I didn't stress so much as I did last year. It was more fun. 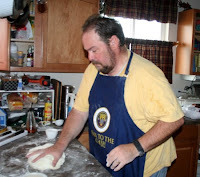 Here, up above, you see me kneading the sourdough. This one I made from a yeast strain that I caught here in Eagle Mountain, UT. When I told the guests about that, we all started joking about how one goes about "Catching a wild yeast"! Crikey! This was the first course, the soup. It was based on a recipe (Chicken Soup with Rice) from a good friend. I added some grilled chicken and shrimp on a skewer just for show. It kinda gave it a unique look, even if they were a little overdone. As a sort of appetizer, though, the soup worked pretty well. Fortunately, there were a lot of leftovers of this course, so I'll eat well for my work lunches for a long time! I pretty much stuck to my friend's original recipe. I did use some home made chicken stock for the base, and added lemon juice. Other than that it was straight ahead soup. The salad course, of course, I didn't do in my dutch ovens. The cheese is mozarella, the dressing a kind of twist of italian and pacific Island. The crumbled cheese is feta. I was going for this look that combined a lot of different circular foods, all on the plate at once, over a bed of spinach. It tasted great, and looked really cool as well. I've been doing a lot of reading about presentation along with the actual cooking. I'm still not very confident in that area, but it's something I'm learning steadily. These are all my guests. They're mostly friends from our neighborhood, and our ward at church, but also a few others from Salt Lake City. We were laughing pretty hard all through the evening, mostly at the expense of our kids! We had a few couples that, unfortunately, had to bow out. While I missed them, and it would have been fun to have them there, it worked out. I had originally overbooked the guest list a little, and I wasn't sure if I'd have enough crown roast to go around. So, as Jodi and I talked about it the night before, we decided I should also do a turkey for some extra food. In the end, even though we had enough roast to go around, a lot of the guests had some turkey too, so it really all worked out well. I did the same citrus turkey that I'd done for Thanksgiving last year. This is the crown roast. I was really nervous doing this, because I'd never done it before. I didn't know how it was going to turn out. I decided to do veggies around it instead of stuffing, and I put some orange slices and an orange/molasses glaze on it as well. As I had worked out the dinner in advance, I'd hit on this idea of doing it all with a sort of citrus theme all the way through. There was lemon juice in the soup, there were lemons, oranges, and grapefruit on the turkey, and oranges and the orange glaze on the pork. The bread had the orange theme, as well, as I put an orange and brown sugar/cinnamon glaze on it as well. And... We drank Sprite mixed with orange juice. I was really pleased with the way the bread turned out. I've learned a lot about making bread over the last year, and it really came together that night. I did it with a braided pattern, in a circle, intead of just hearth loaf. That made it more full in the dutch oven, as well as a little fancier. Half the point of this dinner is to have great food, and half the point is to just make it look more amazing. The dessert was also great. I made this big circular banana bread, with almond slivers and chocolate chunks. Then, when we served it up, we smothered it in a bunch of sauces. One I made was a butter, sugar, and cinnamon sauce, then we also layered on chocolate and caramel sauces. Finally, a tip of whipped cream! The food part of the evening was great, and I was proud of it, but that wasn't the best part, even. It was just a lot of fun to have a lot of good friends over and just kick back and laugh with them all. And today, I could hardly move. But it was still all worth it! Recipes and detailed stories to come! This looks very delicious..thanks for the recipe. This is best when it is cook with dutch oven.